At Home Depot (a massive, warehouse-like construction supplies and equipment store in the United States) today my iPad was pretty helpful. I was able to look up items for comparison, take pictures of things to show my mother since her vantage point in a wheelchair was really a disad-vantage point, and to sketch ideas. Later, while waiting for my steak (!!) at lunch, I was able to play Blocksworld, Linden Lab's iOS-based 3D building game and think about what Our World in Second Life could take from this mobile world. After setting up the blocks I dragged-n-dropped some colors and a texture and *boom* it was done. This was more of a "see if I can do it" exercise. I can save it but it isn't easily moved and I have no idea for what I'd use it, but I spent 10 minutes while eating popcorn and sipping Mt. Dew, so there is no waste, really. 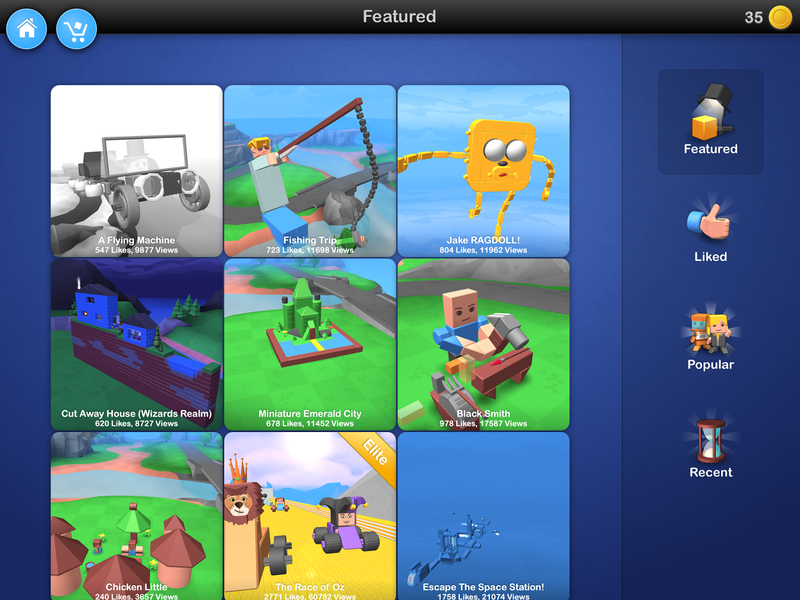 Blocksworld seems to be geared more to vehicles and creating games which involve vehicles. Most of the build kits one can buy with in-game coins fit this description though many of the user-created worlds (and the contents thereof) are split between gaming and creation for creation-sake, like my deck. Lots of possibilities and some very simple tools, like drag-n-drop to script. In Second Life I can't script my way out of a paper bag. Sure, I can make the bag, but ... anyway, if I can't use some pre-written scripts or get someone to script for me, I couldn't make a car, for example. Some 5 minutes in Blocksworld and I'd have a car with steering, reverse gear, and lasers. Drag a wheel to the ground then drag "scripts" to it. Bam. Do that again and you have most of a bicycle. Twice more again and you have a car, more or less. Now imagine Second Life with a similar builder toolbox. Beginners could get started right away making something more sophisticated than a chair. Talk about generating excitement! Talk about potential Resident retention!! Not only could n00bs catch the building bug right away but non-builder residents would have a very simple way to enhance all their in-world purchases. Look inside any Linden Home (ahem ... privacy first!) and you'll see that a majority of residents have cobbled together walls and floors to enhance their homes. Simple stuff, but so many people don't really know how to rez a prim. When I joined Second Life there were people who hung out at Help Island and sandboxes just to show new Residents how to rez a prim. Not so much these days. Visit "worlds" created by other users and play with their builds! Every Blocksworld user has their own "world" – a build space they can call their own, with a pre-set landscape, roads, some water, and even some atmosphere effects. It's pretty cartoonish, but you can actually have several build spaces, naming them for different purposes. No, that's not practical in Second Life, but I have an idea. Give every resident some land. Mainland is incredibly empty. Give non-Premium members 512m2 free to use on the vast, empty Mainland. If they don't want it, they don't have to use it. Premium members could still have a choice of a Linden Home (a great value, I think, compared to just a 512m2 parcel) or they could have 1024m2 of Mainland free to use instead. Like a Linden Home, these lands could not be sold, merely exchanged for another parcel somewhere else or simply not claimed. But everyone would have a space associated with their avatar where they can build and show off what they build. There'd have to be a mechanism in place where folks like me who have met our household's maximum allowed number of accounts would have our land options limited, but ... well, details. I think that that idea is a good one over all and should stimulate account retention. Maybe when I help put up new window treatments tomorrow, hang some shelves, or help swap out the shower hardware, I'll see other features of Blocksworld that might transfer well to Second Life. Or maybe I'll just be tired enough to flop into my bed with my iPad and build stuff in Blocksworld. If I do come up with more ideas, though, I'll be sure to blog about them.